I would like to preface my review by saying that I am a massive Diana Peterfreund fan. From the moment I read Rampant, her book about killer unicorns (I know right?!) I was hooked. When I found out that she was writing a dystopian version of Jane Austen’s Persuasion, I was taken aback. Talk about something different! I got afraid, what if I don’t like this book? Will I still be able to call Ms Peterfreund one of my favourite authors? Or will I hang my head in shame and mumble “Yeah well, the new book is just so different…”? What the hell was I worried about. For Darkness Shows the Stars is AWESOME. First, the cover is beautiful. I know you shouldn’t judge a book by its cover, but still, it’s a plus. Second, I really like the title. It’s a change from the one-word title trend that still has YA land in its grip. It’s a very cool title, even though as a Dutch girl I have troubles pronouncing it correctly. And third, probably the most important one. The story. The STORY, you guys! I flew through For Darkness Shows the Stars in two days. It has everything. A rock-solid foundation in world-building, loveable characters, a super sweet romance, a father you would love to strangle, genetically manipulated ancestors and a devastating war… It has it all! What I especially appreciated is how there isn’t really a villain in For Darkness Shows the Stars. Except for the main character Elliot’s father maybe. I could totally strangle him at times. Almost every single character is a shade of grey. Everyone has been made into what they are, more often than not outside of their own fault. Elliot really has to rethink who she is and what she wants to stand for throughout the book. Elliot is a main character that I love. She is a strong, but humble girl. She chooses the well-being of her subordinates over her own. I admire this trait in her. I’m sick of all the wussy heroines bloating in self-pity. She isn’t perfect though. She’s always so busy thinking of other people first, that she forgets herself. 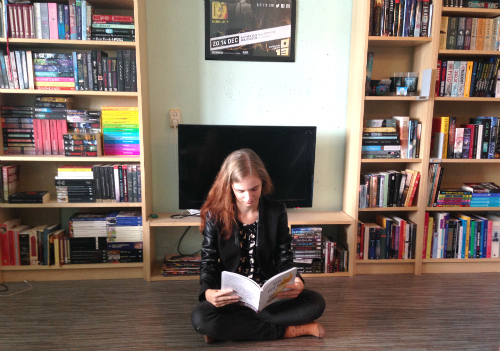 Throughout the book she learns how to stand up for herself. 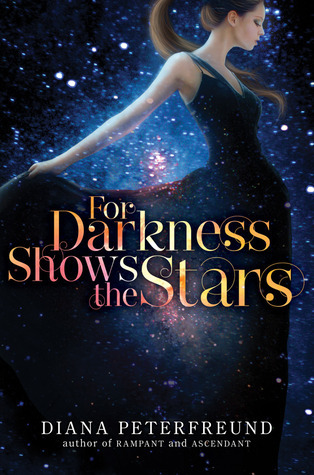 Of course, I can’t write a review of For Darkness Shows the Stars without talking about the love interest. Kai is, just like this book, awesome. I’m a big sucker for the kind of dark and broody guys, and Kai lived up to it. What could have been a very difficult and painful relationship, Ms Peterfreund made Kai swoonworthy by adding letters. Letters from when Kai and Elliot were friends as kids. They show a softer side of him, but also show the start of what makes him as he is now. Why yes, I know that I’m being mysterious. But I just really don’t want to spoil anything for you! All I have to say on the matter is that from the start of the book, I was rooting for Kai and Elliot to have a happy ending, one way or another. Do you like romance? Read this book. Do you like post-apocalyptic? Read this book. Do you like horses? Read this book. Do you think Elliot is a cool name for a girl? Read this book.